Ok, this is for ladies; and my Howto pick for this week. 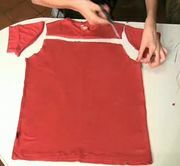 A step by step with video guide on turning an over stretched t-shirt into mini skirt. Save the t-shirt, saved the world. Brilliant! After re-emerging from the sinking city, all I want is to accomplish 2 things. Start a nation and love my wife more..